We empower the world's leading brands and agencies to engage global audiences. 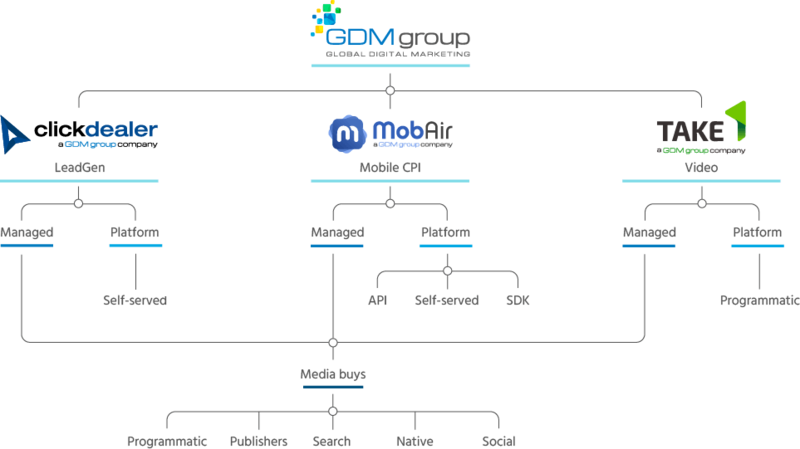 GDM Group's family of solutions delivers a comprehensive set of marketing services, including performance, mobile, video, programmatic marketing and media buying. Through the GDMG umbrella, clients are able to drive revenues and increase brand awareness while expanding their existing markets and entering new ones - both domestic and global. We are creating a diverse network of trusted partners capable of delivering consistent results within every element of advertising and developing new directions in the industry, all while maintaining the quality of environment required to maximize our operation’s capacity. We strive for perfection in every aspect of our craft, providing only top quality services. We invest heavily in our team — their ideas and knowledge are our most valuable resource. Honesty and integrity are vital when it comes to dealing with partners. This is the foundational tenet of our relationships and reputation. We push boundaries in everything we do to further grow and improve.